This isn’t a recipe so much as it is (hopefully) an inspiration for you to create your own version using whatever you can find in your fridge/cupboard! That’s exactly how this dish came to be. I definitely encourage you to subtract whatever you want and to add whatever you can think of! What follows is an ingredient list without quantities, because a) I was making it up as I went along so I didn’t measure anything and b) it allows you to taste test and tap into your creativity! Combine all ingredients (except tofu) in a dish, mix and taste until you feel it’s ready. Cut tofu block into 8 pieces (slice block into four layers, then cut each of those in half). Marinate for at least 15 minutes (the longer, the better). Transfer tofu to baking sheet and drizzle some of the remaining marinade on top. Bake at 400 degrees for 25 minutes, flipping the tofu halfway through. Prepare quinoa according to instructions on the package. Once ready, stir in a small splash of olive oil to keep it from sticking. Set aside. For the sauce, start by blending cashews (about a handful) and water (just enough to cover the cashews) in a high-speed blender. When desired consistency is reached, add all remaining ingredients except the chipotle peppers. Whenever I make a spicy sauce, I like to add the spice last, so I can make sure the rest of my flavor is on point first. Once you think you have an excellent creamy, tomato-y base, add the first chipotle and blend. If too mild, add more. If you have a Vitamix (or similar magical machine), blend on high for a few minutes until the sauce is hot. Add to quinoa and stir well. Dice onion, avocado, and cucumber as small as you have the patience for. Drain and rinse black beans, then add those in. Add and stir in a pinch of salt and pepper. Once all the pieces are prepared, plate your dish! 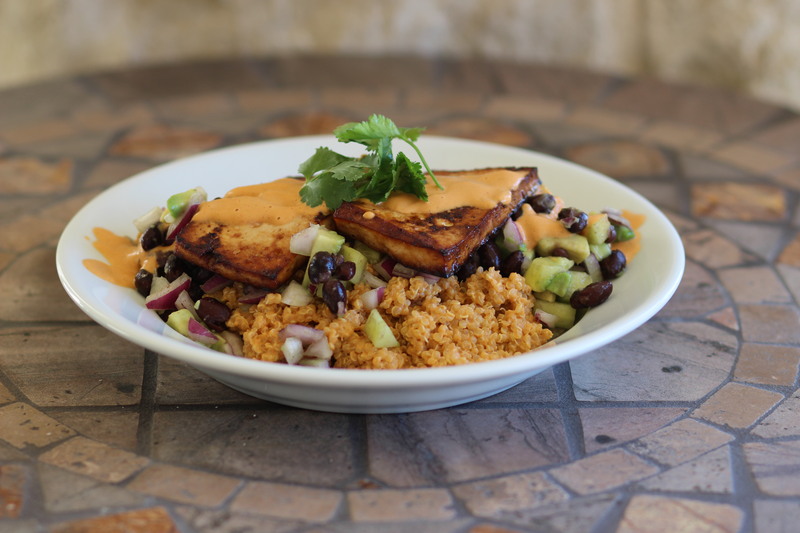 Quinoa at the bottom, salsa across that, tofu arranged on top. Drizzle extra sauce (I made way too much) across the tofu, and garnish with cilantro or a similarly refreshing herb. Enjoy!